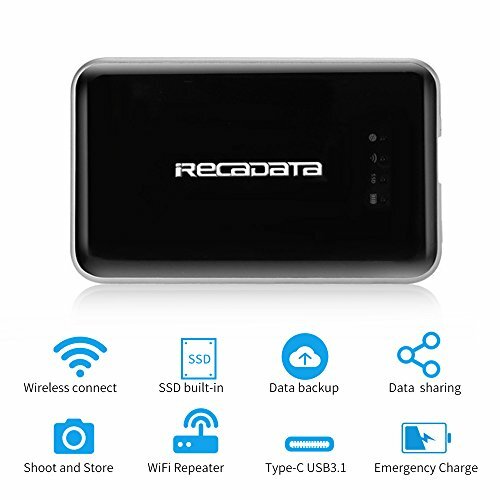 【Portable SSD Hard Drive】iRecadata i7 is an external SSD hard drive for mobile phone, tablet, computer and other wireless expansion at the same time. 【Wireless WiFi Transferring Method】Built-in WiFi Smart Transmitter, you can immediately transfer data and save them. 【Wireless Travel Router Function】Instantly Convert a Wired Network to Wireless Network. Extend WiFi Signal, Share Internet Securely. 【USB 3.1 Type-C】USB-C Interface Make Transfers Quite Quick and Fast. Save Your Time A Lot! 【Emergency Charging】Built-in 2250mAh Lithium-ion Polymer Battery, charge Your Phone or other Device for Emergency.